Image Comics is pleased to announce the highly anticipated second volume in the critically-acclaimed sci-fi series from Ken Garing in PLANETOID: PRAXIS. PRAXIS is set to hit stores this February 2017. In PLANETOID: PRAXIS, the inhabitants of a distant planetoid have fought off their robot overlords and established a thriving settlement on the planetoid's mechanized surface. Now, years later, their de facto leader, Onica, must grapple with a new complication when their isolated way of life is threatened by the arrival of an unexpected visitor. 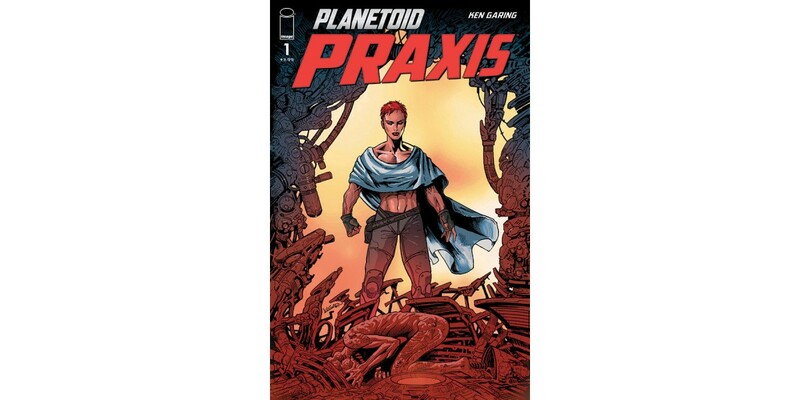 PLANETOID: PRAXIS expands the world created in the first volume, but is a standalone story that can be enjoyed by fans of the first volume, or discovered by new readers interested in a thoughtful science-fiction story with political undertones. Readers were first introduced to the PLANETOID world through Silas, an ex-soldier turned space pirate. Silas’ story of survival and resilience in a dystopian wasteland of roving cyborg militias, hostile aliens, and nomadic tribes resonated with critics at launch. Ain’t It Cool News called PLANETOID “richly and beautifully illustrated.” Multiversity Comics praised Garing’s ability to write each short issue as though it were a fully-fleshed out journey for the reader. The series garnered recommendations from iFanboy, Kirkus Reviews, Bloody Disgusting, Crave Online, and others. PLANETOID: PRAXIS #1 (Diamond Code DEC160672) hits stores on Wednesday, February 1st. The final order cutoff for comics retailers is Monday, January 9th.